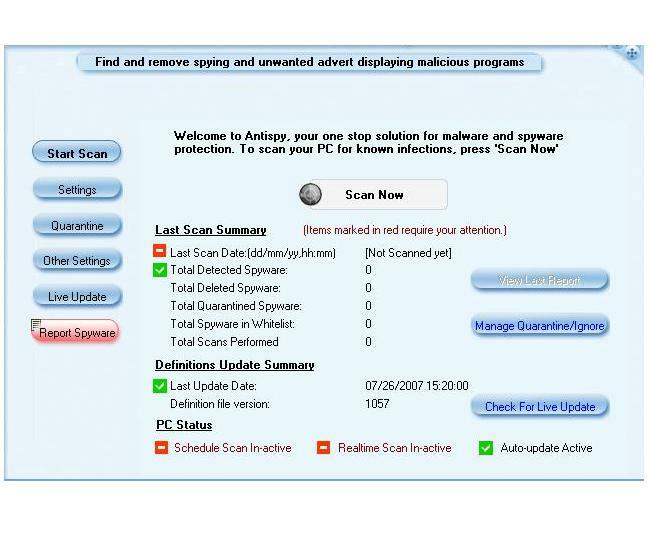 Omniquad AntiSpy finds and removes spying and advert-displaying programs from your computer. Spyware snooping on your system, secretly monitoring and broadcasting your computer activities pose serious security and privacy issues. It has the following features- Fastest Scanning mechanism, Automatic incremental signature updates, Schedule Scan, Realtime Scanning, User friendly interface to manage quarantined Spyware and many more. Qweas is providing links to AntiSpy TS3.0.0/AS5.0.0 as a courtesy, and makes no representations regarding AntiSpy or any other applications or any information related thereto. Any questions, complaints or claims regarding this application AntiSpy TS3.0.0/AS5.0.0 must be directed to the appropriate software vendor. You may click the publisher link of AntiSpy on the top of this page to get more details about the vendor.